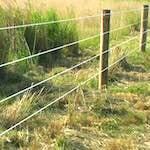 At ProFence, LLC, we supply and install numerous types of fencing for keeping animals on your property, and to shield your livestock from predators. 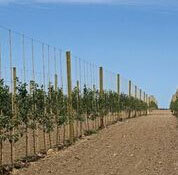 We also supply and install trellis fencing for your orchard, vineyard or crop farm. A metal or wooden trellis system makes it easy for climbing plants to grow. We have been installing trellis fencing since the early nineties and are always proud to see healthy climbing plants growing into a trellis fence we installed years ago. Trellis fencing is ideal for climbing plants that need support as they mature or for fruit trees that need support for the heavy fruit load. 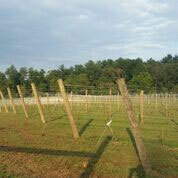 The most common types of trellis systems we install are for vineyards or for orchards. If you have other trellis system needs such as tomatoes, peas or flowers, please give us a call and we will be happy to give you a quote for your specific requirements. 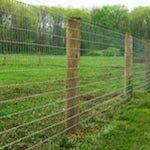 We will be happy to share with you more of our trellis fencing designs. Here is a recent trellis fence install we performed. 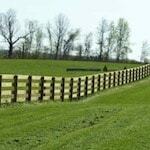 Contact us today for a Trellis Fencing Consultation. 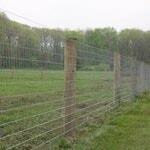 The high tensile wire we use for all our metal and wood trellises uses a class 3 galvanized coated wire. Corrosion is slowed by a zinc/aluminum alloy that forms a protective oxide. 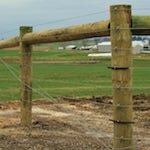 All metal posts also have a galvanized coating for superior durability and protection. Wooden posts are a Southern Yellow Treated Pine post available in a variety of diameters and lengths to fit your specific requirements. Having a solid trellis system that lasts for decades will let you concentrate on growing your plants and not worrying about your trellis fencing. If you need a trellis fence for climbing plants installed on your property, give us a call or fill out our Free Fencing Estimate Form. 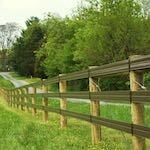 We have decades of trellis fence installation experience.